The PM140 Series incorporates our Integrating Sphere Sensors to enable precise measurements widely independent of beam shape and entrance angle. 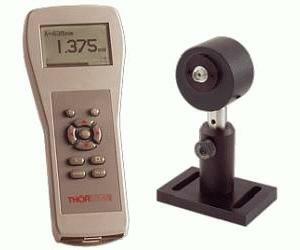 It is especially useful for measuring highly divergent beams leaving optical fibers or beams with higher power. The sensors are available for a wavelength range of 400-1700nm and for a power range of 1μW to 1W. The unit is supplied with an FC fiber adapter. Most industry standard fiber adapters including FC, ST, SC, bare fiber, and SMA, are available as accessories and can be easily installed. Two sets of #8-32 and M4 threaded mounting holes allow mounting into our standard post and post holders. The PM140 Series comes with an integrating sphere including a Si or InGaAs detector. This series is ideal for optical power measurements of divergent beams such as at the output of optical fibers. Easily replaceable adapters enable free space measurements as well as the use of FC, SMA or SC fiber connectors.